Washington (CNN) - Democrats are fond of labeling the 113th Congress "the least productive Congress in modern history." And according to a new poll, a strong majority Americans agree with them. 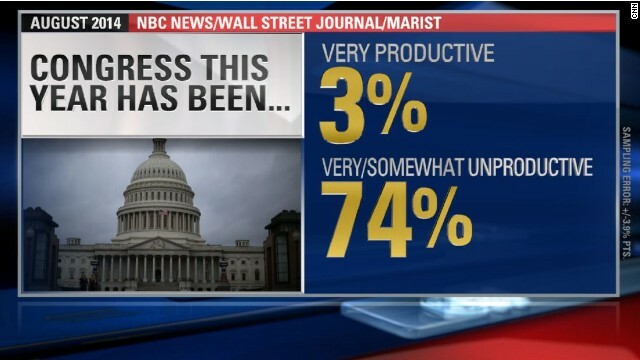 Nearly three-fourths (74%) of registered voters said Congress has been "very unproductive" or "somewhat unproductive" this year, according to a poll released Sunday by NBC News/Wall Street Journal/Marist College. Only 19% of registered voters said Congress has been "somewhat productive," while only 3% of registered voters said the senators and House members of Capitol Hill have been "productive." Sunday's poll is just the latest data point that shows how unpopular Congress has become. According to Gallup, only 15% of Americans approve of Congress, while just 7% say they have "a great deal" or quite a lot" of support for the legislative body. Another Gallup poll from 2013 also found that Americans have more faith in the ethics of car salespeople, TV reporters and lawyers than members of Congress. Democrats, who say House Republicans are the ones blocking legislation, have hammered Congress for its lack of productivity. "This has become the least productive Congress in modern history, recent memory," President Barack Obama said in April repeating a charge that Democrats have made a number of times. House Republicans, however, contend that it is the Democratic Senate that's keeping Congress from getting anything done. Last year, House Speaker John Boehner was asked about becoming the least productive Congress in history. Responding to the criticism, Boehner said Congress "ought to be judged on how many laws we repeal." The telephone poll conducted between July 28-31 of 634 registered voters has a margin of error of plus-or-minus 3.9%. Why isn't the Democrat controlled Senate in session and voting on the bill that the House passed to deal with the invasion of our country on our southern border? What are the Democrats afraid of? Something passing? Simple math Tommy: The Senate has 100 members. The Republicans have more than 40 votes, and the Democrats have more than 50 votes. Through the excessive use of the filibuster, the Republicans have required a supermajority vote of 60% to pass everything. Ergo, the GOP controls the Legislative function of the U.S. Government, and their choice it to break the process- and they have done it quite well. Democrats control the senate like someone with the keys to a car with one of those wheel lock things on it controls the car. Rick Perry's already got it under control with his militant army standing ready to mow down the immigrant children in the name of family values. The gay global warming scientists are coming with a gay-ray to turn everyone gay. The only way to stop them is to send money to the Koch brothers, care of Mitt Romney. Let's go fellow Repubs, band together now. Put your money where your mouth is, folks, and VOTE OUT the gop/tea bag majority in the House. And give the Dems a 60-seat majority in the Senate to end this filibuster nonsense. November 4, 2014, can't come fast enough for me!